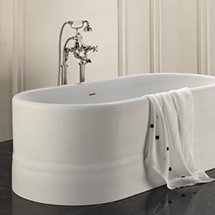 With a reputation founded on quality and excellence, Studio Bagno has been delivering the most exciting collection of bathroom products to the Australian market from all of over the world for the past six years. Studio Bagno’s style and quality is represented in their LUXE range of bathroomware – a truly inspirational collection of handcrafted Italian sanitaryware. Studio Bagno offers a handpicked selection of bench, wall-mounted, semi-recessed and undercounter basins, to luxurious console or pedestal basins – and their tapware range will complement any bathroom. No matter what you desire from your bathroom, Studio Bagno has a quality product to suit your needs and budget.